Oeufs a la neige/Iles Flottanes/Snow Eggs/Floating islands to give them their full title in French and English. Whichever you choose to use, they are all a classic and an absolute delight. I’ve been meaning to cook this dish ever since I first saw them years ago, just never got round to it. They look impressive, taste out of this world and are relatively straight forward! We just have some gorgeous meringues which are poached in milk. Drizzled with caramel and placed into a pond of custard. I refuse to call it creme anglaise. These are quite straight forward once you know what you’re doing. They can also be knocked up in around 30 minutes. I’ll explain the gotchas and must nots in the recipe below. I make my custard in a rather unusual way. Normal way is to beat egg yolks and sugar together. Warm the milk then add hot milk to cold eggs. There’s only one thing that’s going to happen here. You’ll get tiny bits of cooked egg in your custard. Not ideal. So I still beat the yolks and sugar together, but just whisk in cold milk and then slowly heat in a pan. It works perfectly and saves you having to warm the milk in the first place. I’ve also found that adding an extra yolk to the mix makes a better consistency of custard. Usual rule of thumb is one yolk to 100ml of milk. PS If you leave a comment on any of my posts at the moment, it throws and error message up at the senders end. I get it too when I reply. They still come through as normal. I’m working on it with my tech guy. Start with a large glass or metal bowl. Add the egg whites and a tiny squeeze of lemon juice. Whisk until all the liquid has gone and you have loose frothy egg whites. Now add the sugar slowly bit by bit. If not, the egg whites won't whip up properly or hard enough. So i drizzle in the sugar one tablespoon at a time as I keep whisking. Once all the sugar is in you'll quickly have soft peaks. Where a ribbon is formed but the peak won't hold. Keep going for another 1-2 minutes. Eventually the egg whites will be at stiff peaks. Don't over whisk or they can go the other way and deflate! Warm the 300ml milk with 300ml water and a spoonful of sugar. You just want tiny bubbles around the outside. Too hot and the whites inflate quickly without cooking so once you remove them deflate. You then have a big dimple in the middle. I use two dessert spoons to make a large egg shape out of the meringue. Slide this off with one spoon into the milk. Poach for 2-3 mins, flip over, you'll see how they firm up and grow. Poach for 2-3mins on the other side. Remove and place on a wire rack to drain. Repeat until mixture is used up. I get about 20 out of this mix. Custard. As described above. Add the sugar to the yolks, beat/whisk until pale and frothy (3-4 minutes). Add the milk and vanilla whisk well to incorporate. Add to a pan and place on a low heat. Heat slowly stirring every minute or so until it begins to warm. Do not leave it now. It will take about 10minutes in total. As soon as you rush it or turn the heat up usually this is when it will curdle. Patience, patience, patience. You will feel it cook as the mix will thicken as the eggs cook. It's done when it's double cream consistency. It will thicken a touch more as it cools. For the caramel, heat the sugar in a dry pan over a medium heat. After about 3-4 minutes it will turn a lovely caramel colour. Stir a little with all the dry sugar. Take off the heat as soon as its liquid and medium brown colour. With a large spoonful of carmel, then drizzle over the oeufs on the wire rack. To reheat the custard if need be, only heat in a pan. It will curdle if you use a microwave. Then place the oeufs on top. Voila. Simple, right? Making floating islands has my list to make for a long time. Thanks for the recipe. Must try Gerlinde. One of France’ best exports. Pretty. It’s such a lovely dessert. Once my husband and I took my French mother out to dinner at a French restaurant. We had little money, but wanted to treat her. She never approves of anything at any restaurant, so I don’t know why we bothered. (She’s still that way at 88!). In any case, she ordered oeufs a la neige for dessert, claimed it was disgusting and pushed it away. The next night she made it for us, and it was so much better! Didn’t even use a recipe!!! I’ll never forget that! What a story Mimi. Love it. I’m getting that way at times. I saw this title in my email and had to visit. The FIRST thing I do in Paris is get a crepe off the street vendor and the FIRST dessert is always Îles flottantes. It’s something my French grandmother used to make but not very often. I haven’t made this for years but now I want to. Thanks for great memories. Hi Maureen, they are so nice. We had crepe suzette on holidays this year and they were burnt! Put off for life. These little things however, first thing I’m going to look for myself in future. This is truly a beautiful dessert Dave, my Mom used to make it when I was a kid. In Hungarian, it is Madártej (bird’s milk), kinda weird but maybe they thought the clouds of meringue looked like nests? I’ve made it only once at home and I it did not turn out great but I think I dried out my meringue, then I made it again when I tested the T-Fal Cuisine Companion (the T-Fal’s version of the Thermomix). 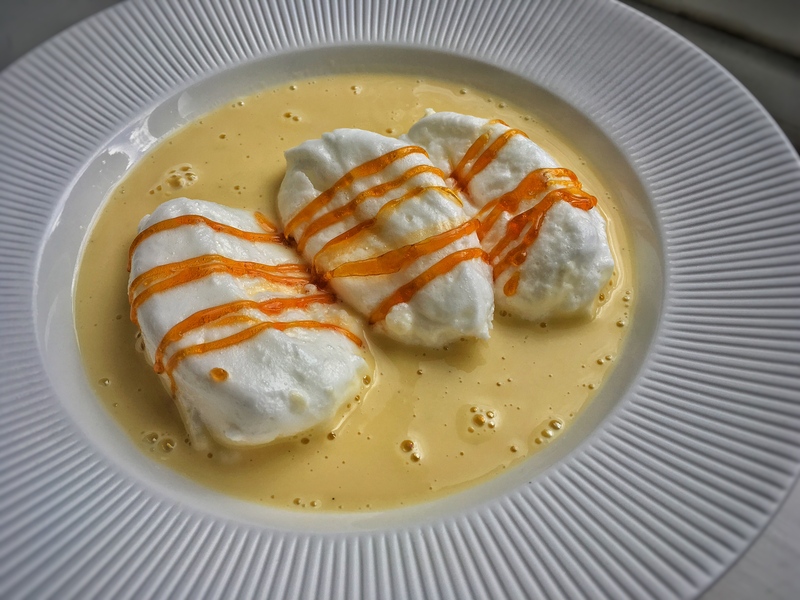 The meringue isn’t poached but softly cooked by a gentle heat http://www.tefal.com/recipe/Floating-Islands/123752. I am going to try this recipe again, you’ve reminded me of how much we used to love it. I like the way Tefal just adds cold milk to the eggs like I do. None of this faffing about warming the milk. I like the cold milk way of making custard too, that’s how I do it as well. Any time you can save a pot from clean up! Hope you are well! Still flying to the US? Waiting for you to stop by one day! PS: what’s going on with the whole Brexit thing?? Hope you’re well. I’m currently just doing Europe, it’s been a busy 7/8 months only home one day a week, so its nice to just be there and back everyday for now. It’ll change soon though. Brexit- in brief, I voted for it because Brussels is a juggernaut of unelected bureaucrats. Making it up as they go along to protect themselves. There are 10,000 Members of Euro Parliament all earning €200k/year. To decide how straight our bananas need to be! The UK economy was OK last few years, so we had to pay an £2.1Billion just because the economy did well. Britain has many of its own problems which Europe doesn’t help. Maybe a union between Britain/Germany/France would work, but too many countries are a waste of space. It’s like you guys merging with Canada, ok, and Mexico, definitely not and having a single currency. It will never work. Hi Greg, sorry for the delay. Behind the scenes gremlins have hidden all the comments. Anyway, it is a must dessert for a foodie. Absolute heaven. I’ve been to plenty of restaurants and eaten desserts which are a work of art, then …. taste of nothing. Can’t beat the classics.